just f giggles i'm wondering what you think of gary becker? On a list of economists whose work I will read in a few years hopefully. (I don't have as much time to read for pleasure as I used to--consumed with school). pretty sure I have a sweet BXR embarrassment clip on "Kys 4 me"
Well obviously this is because of a negative shock to the taste parameter on leisure in the representative consumer's utility function! I admit such a thing. "Something has happened to how people value leisure? Well then a shock must have happened which changed it. Where did the shock come from? We don't care; we'll assume it's an AR(1) stochastic process and see what happens to the economy." Depends on the purpose of the study. I actually think this is a fine stopping point for the economist qua economist, as long as the shock on leisure is not more suitably modeled as a function of other variables already in the model. If you want to see what happens to the economy when people value leisure less than before, irrespective of the reason for this change in valuation of leisure, then this is the proper way to do things. If you are interested in why the value of leisure might change, this obviously tells you nothing. Hence the need for other social sciences to investigate these sorts of questions. unfortunately it appears as though the whole second page of my reich thread is inaccessible. is that the case for you as well, or only me? Depends on the purpose of the study. I actually think this is a fine stopping point for the economist qua economist, as long as the shock on leisure is not more suitably modeled as a function of other variables already in the model. If you want to see what happens to the economy when people value leisure less than before, irrespective of the reason for this change in valuation of leisure, then this is the proper way to do things. In the nineteenth century, with the complete opposition between individual life and species life (everyday life versus automatic commodity circulation), all hopes were allowed (those of Hegel, those of Marx[, you name it.]). At that stage things were clear: everyday life was nothing, circulation was everything.The nothingness of everyday life was a visible moment of the all-encompassing circulation. Fetishism scarcely deceived anyone but the ruling class and its toadies. Several times the proletariat launched an assault on the totality, and the publicity of misery came very close to triumphing over the misery of publicity. circulation was everything-- harried, trivially (albeit massively) productive, meaningless. 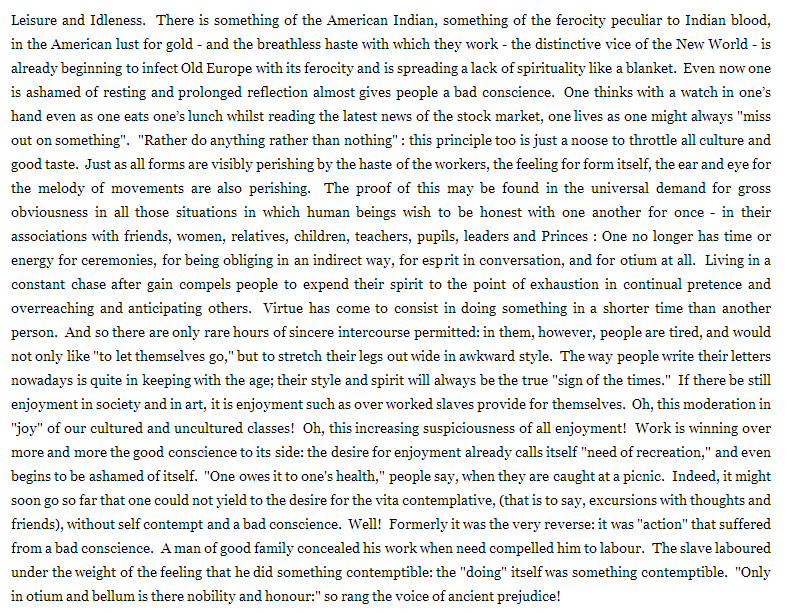 the dawn of consumer society, the creation of "leisure", that historically specific notion of "not working but consuming so as to keep working, to prepare better for work (unpaid) and to do the work more efficiently, and more virtuously" or at best "to give myself an immodest break from working before working again"
everyday life was nothing because it was harried, trivially productive and meaningless to the people going through the motions (people afflicted with self-imposed stasis neuroses, as these are only actual striations over their energies and projects). harried, meaningless circulation is everything in a world of appearances; so the spectator, as producer of this world of mere speculation, puts his energies into contributing to an absurd, meaningless accumulation that we still today in 2015 want to call our culture. he keeps a meager allowance for himself and in his "leisure time" he idles without the means or education for attaining some level of actual enjoyment, of orgastic release from the nooses and binds he's made up for himself, with institutional education; because he himself circulates only in the economic sphere, both at work and in leisurely pursuit, he arrives at and habitually reproduces with and within his own systems a neurotic state, an actual stasis or "non-circulation"-- a binding, a reactionary formation-- of what is really valuable for life qua life, the productive energies coursing through him. so what good is the economist in your estimate? fascism is "a problem of pure matter, a phenomenon of physical, biological, psychic, social, or cosmic matter."